Window World 4000 Energy Plus provides additional energy efficiency and a beautiful finish. Window World 4000 Energy Plus Siding features a contoured insulating underlayment designed to fill in the gaps left behind with traditional non-insulated siding. 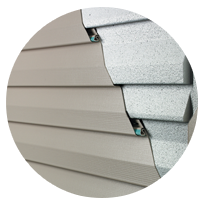 Its premium 1-1⁄4″ thickness is designed to provide an extra blanket of protection versus traditional siding. The contoured insulating underlayment is engineered specifically for Window World 4000 Energy Plus Siding. Together they deliver 5 times more impact resistance than conventional siding. The result is a siding system designed to withstand not only typical ‘around the house’ accidents, but also Mother Nature’s worst. Window World 4000 Energy Plus Siding, with a Perm Rating of 5, is designed to not trap moisture, but allow your exterior walls to breathe. In addition, an organic additive deters termites from nesting behind your siding, yet is non-toxic and safe for humans and pets. Plus, Window World 4000 Energy Plus Siding is backed by a lifetime, limited transferable warranty — including fade and hail protection. An exceptional siding is one that not only provides durability, energy efficiency and protection, but most importantly, looks beautiful for a lifetime. Window World’s 4000 Energy Plus insulating underlayment adds strength and support, providing straight and true course lines, not the wavy or flimsy appearance sometimes associated with low-grade siding. 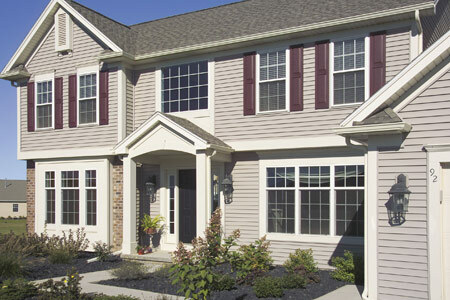 Think 4000 Energy Plus Vinyl Siding could be right for your Huntsville home? Contact us today for your free home estimate!